Dependable, accurate weighing of large cases, bags, boxes and barrels up to 110 lbs. Durable, dependable and accurate, the Versa Frame 44 consists of a heavy-duty weighframe and the Versa Control microprocessor. Created for rugged, industrial environments, the Versa Frame 44 provides line rates up to 100 packages per minute—up to 300 fpm depending on package length. It is the perfect choice for large and heavy packages. Thermo Scientific Versa Frame 44 checkweighers are engineered for true in-motion weighing—that means it will accurately weigh a wide variety of packages without stopping the conveyor for recalibration. This flexibility guarantees that you'll experience maximum productivity at all times. In addition, the Versa Frame 44 comes with a USDA/FDA approved food grade belt—making it the ideal choice for transferring raw or frozen products, bags, cases or barrels. This checkweigher is also available with optional infeed spacing belts and discharge conveyors in addition to reject devices, visual and audible alarms. 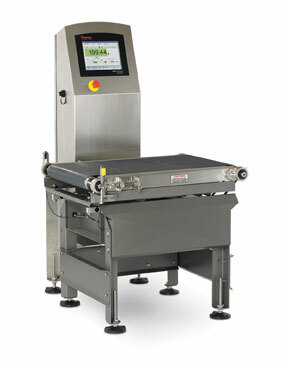 Dependable and accurate on-line weighing of packages up to 110 lb.